The Pirates! Band of Misfits, co-directed by Peter Lord and Jeff Newitt, is another fast-paced animated comedy from Aardman Animation, the makers of Wallace and Gromit. 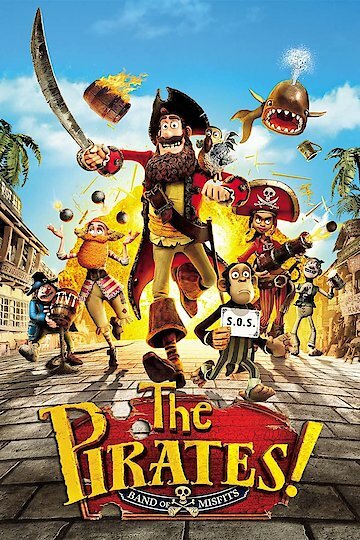 Filled with quick sight gags and plenty of verbal comedy, the film follows the fortune of Pirate Captain (Hugh Grant) and his faithful sidekick The Pirate With a Scarf (Martin Freeman). Pirate Captain wants nothing more than to become Pirate of the Year, but he and his crew haven't been having much luck lately when it comes to finding treasure. His fortunes seem to turn at last when a scientist who just happens to be named Charles Darwin (David Tennant) lets him know that his beloved parrot Polly is actually a dodo bird that other scientists will be thrilled to see, since everyone thought dodos were extinct. It turns out, however, that Darwin and even Queen Victoria have nefarious designs on his bird, and Pirate Captain isn't sure this adventure is turning out to his advantage after all. The Pirates! Band of Misfits is currently available to watch and stream, download, buy on demand at Starz, Amazon, Vudu, Google Play, FandangoNow, iTunes, YouTube VOD online.